There are many tools such as WinZip, WinRAR and 7-Zip that allow you to encrypt your private photos in password-protected archive files easily. These tools secure your photos and save your disk space. However, viewing these photos can be complicated and insecure. To view photos in an archive file, generally you have to decrypt and save them temporarily somewhere on your hard drive before you can view them in an image viewer. When you finish viewing, you must delete the temporary files, or you will have a risk of exposing the photos to unauthorized people. The whole process is not only slow, but also creates security concerns. MaxView is designed to view ZIP, RAR and 7-Zip archive files directly, conveniently and securely. There is no need to extract them to a temporary folder any more. All you need to do is open the archive file in MaxView and enter a correct password. Decryption is done within MaxView's private working memory, thus leaves no trace on the hard drive for unauthorized viewing. 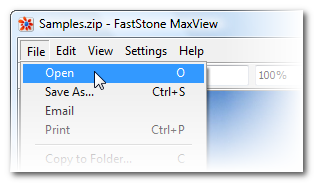 In Windows Explorer, right click on the archive file and select "Browse with MaxView" in the popup menu. In MaxView, select menu File -> Open. A dialog will appear to let you locate and open the archive file. 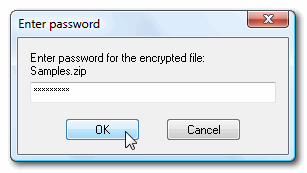 MaxView supports 128-bit and 256-bit AES encryption. If the archive is encrypted, you will be prompted for a correct password before you can view its photos. When the archive file is opened in MaxView, its folder structure and thumbnail list will appear on the left hand side of the window. You can view the photos by zooming, scrolling, and even playing a full-screen slideshow with your favorite music. When finished, simply close MaxView and it will leave nothing behind for others.